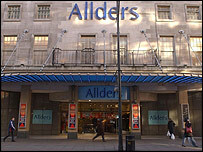 Administrators for collapsed retail chain Allders have sold a total of 24 stores to Debenhams, Bhs and Primark. The 143-year-old Allders business went under last month after falling victim to tough trading conditions and the failure of its owners to find a buyer. Kroll, the company handling the administration, said Debenhams had bought eight stores, Bhs 10 sites, while Primark had taken over six. Kroll did not say how much had been raised from the store sales. On Friday, 680 jobs were cut at Allders, with 471 store employees being made redundant and 209 positions going at the firm's headquarters and from its logistics operations. Kroll said on Monday that it hoped the store sales would safeguard more than 2,000 out of a total of 5,000 jobs. "A significant number of employees are expected to be taken on by the new owners but at this stage a full and final figure is not yet known," Kroll said. Kroll said it was now examining options for the 21 Allders store not yet sold, and for the firm's head office in Croydon, south London. A Debenhams spokesman said the purchases formed part of its strategy to open in more than 200 locations. Debenhams also confirmed on Monday it had agreed to sell 23 of its department stores to property group British Land for £495m. The stores, including sites in London's Oxford Street, Manchester and Cardiff, will be leased back from March for an annual rent of £27.9m over a term of about 30 years.